June 22, 2013: Listen to Tomika Anderson’s interesting take on interracial dating on The Jennifer Keitt Show on Atlanta’s 104 Kiss FM. I speak at 26:45. Ms. Anderson is a featured author in “Where Did Our Love Go! June 15, 2013: Ed Gordon and Leslie Gordon (contributor) are interviewed by Essence about their marriage and new blended family. June 6, 2013: Contributors Anthony Hamilton and his wife are interviewed by Essence about their marriage and relationship. June 6, 2013: Tomika Anderson posts an interview with author. May 30, 2013: Rodney Carmichael posts a review on Creative Loafing Atlanta and interviews author. May 26, 2013: The Fay Observer posted an online article which mentioned Where Did Our Love Go in an article about books and named some of the essayists who contributed to the book. May 17, 2013: Lorrie Irby Jackson reviews Where Did Our Love Go and interviews Gil Robertson. Interview also posted on writer’s website. May 15, 2013: A Where Did Our Love Go panel was hosted at the Hammonds House in Atlanta, GA.
May 15, 2013: Author writes a piece for the Huffington Post which tackles the same issue as the book, and his book is mentioned in his author bio. May 2013: The Midwest Book Review Library Bookwatch is featuring Where Did Our Love Go, and the review will be available on their website for the next several years. May 9, 2013: MyBrownBaby.com posts an excerpt of an essay from the book by Tarsha Hamilton and adds a note at the end about where the book can be purchased. May 8, 2013: Shelia Poole of the Atlanta Journal-Constitution interviews Gil L. Robertson, writes about Where Did Our Love Go, and previews the upcoming Hammonds House Museum event. May 1, 2013: The review by Terri Schlichenmeyer is run by the Washington Informer. April 29, 2013: Alexis Garrett Stodghill interviews Gil R. Robertson for an article posted on thegrio.com, a news and opinion site. April 30, 2013: The Terri Schlichenmeyer review of Where Did Our Love Go is run by the Newton Citizen. April 25, 2013: Electonic Urban Report posts an interview with Gil R. Robertson by Darlene Donloe. It mentions that he will be doing a tour called Black Love Is Forever, where he will host Town Hall forums about the relationship gap. April 20, 2013: Vibe TV interviews Gil Robertson and Amy Elisa Keith about relationships and marriage. April 19, 2013: The Post News Group publishes a review of Where Did Our Love Go by Terri Schlichenmeyer. April 19, 2013: AOL Patch posts the third part of their three-part video series on Where Did Our Love Go, featuring book contributors Amy Elisa Keith and Ed Garnes. April 19, 2013: The Call and Post, a newspaper in Ohio, runs the review of Where Did Our Love Go by Terri Schlichenmeyer. April 11, 2013: Allhiphop.com posts an article about Where Did Our Love Go and also featured a Q&A session with Gil Robertson. April 5, 2013: AOL Patch posts the second video in a three-part video series on Where Did Our Love Go, featuring book contributors Amy Elisa Keith and Ed Garnes. March 30, 2013: AOL Patch is doing a three-part video series on Where Did Our Love Go, featuring book contributors Amy Elisa Keith and Ed Garnes. March 27, 2013: Hip-Hop Wired posts an article online with a brief description of the book, including information copied from press release. Includes the book’s cover image. March 21, 2013: The Hinterland Gazette posts a brief article on Where Did Our Love Go and includes the embedded video from HLN TV. March 20, 2013: The Urban Daily online posts a short article about the book and includes a link to the book’s website and a cover image. March 18, 2013: JET magazine posts an essay (from the book) by Anthony Hamilton on their site and it runs with information about their book giveaway. March 14, 2013: Blackandmarriedwithkids.com posts an excerpt on their website, with a short introduction about the book and author. March 7, 2013: A brief article is posted on the DePauw University website about an alum who contributed.. The article includes a link on Amazon to order the book. March 4, 2013: Blackrefer.com reposts information of Where Did Our Love Go taken from the press kit. March 4, 2013: The February 25, 2013 review of the book by Kam Williams is picked up and posted by blacknj.org, and includes an Amazon link to order the book. March 1, 2013: The February 25, 2013 review of the book by Kam Williams is picked up by aalbc.com and posted online with a link to their post of Kam Williams interview, and includes an Amazon link to order the book. February 28–March 6, 2013: This print edition of the New York Beacon publishes the interview of Gil L. Robertson by Kam Williams. February 28, 2013: The New Journal and Guide online picks up the Kam Williams review of the book and posts it online. February 28, 2013: Sonya Eskridge posts about the book on S2S Magazine’s online site. February 25, 2013: The New Tri-State Defender publishes a review by Kam Williams online. 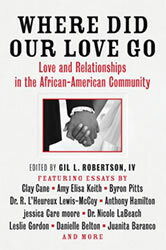 February 19, 2013: BET posts a list of ten must-read books, including Where Did Our Love Go by Gil L. Robertson. February 19, 2013: Gil L. Robertson is interviewed for an article on News Blaze, where he talks about the book. January 28, 2013: The Electronic Urban Report‘s website published a review about Gil Robertson’s book, noting that it would be supported by tour dates throughout February, March, and April in major U.S. cities. June 4, 2013: Author appeared on NPR’s “Tell Me More” with Michel Martin to discuss the state of African-American relationships. March 26, 2013: Gil L. Robertson is interviewed on Arise News, and discusses Where Did Our Love Go along with mentioning his previous books. March 22, 2013: Robertson appears on the Wendy Williams Show on WCLK Radio. March 20, 2013: Gil L. Robertson appears on the Weekend Express segment of HLN TV and discusses the topic of his book. March 17, 2013: A segment about the book is scheduled to air on CW69, a local station in Atlanta. March 15, 2013: Gil Robertson is listed as a guest to appear on Natasha Curry’s “Weekend Express” program on HLN. March 12, 2013: Gil Robertson was interviewed on WSB Radio, a station which broadcasts in Atlanta. March 1, 2013: Clay Cane posts a broadcast of his interview with Gil L. Robertson about Where Did Our Love Go (which features one of Clay Cane’s essays) on his online website.